It’ll take a tall, hot Texan and a little holiday spirit to mend a broken heart and catch a Christmas killer . . . Savanna Edwards is feeling downright Scrooge-like. Who can blame her? 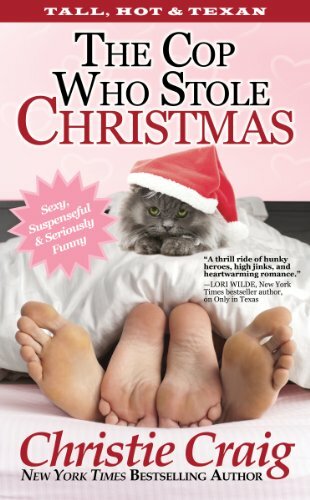 A truly unjolly Santa—suit, beard and all—just repossessed her car because of her ex’s shady business dealings. She’d like to murder the no-good lying cheat, but somebody already did that for her—and left him right in the middle of her kitchen, wrapped up with a bow. Detective Mark Donaldson has a rule against getting involved with his neighbors. He can look—and he’s studied every sweet curve of Savanna from across the street—but he can’t touch. So when she lands on his doorstep in need of help, he finds himself torn between being naughty or nice, and fights every urge to unwrap her like a shiny new Christmas present. Trouble is, even Mark can’t resist a little holiday magic . . . and there’s definitely something magical happening between him and the girl next door.